The development of hatchery technology and its adaptation to suit the characteristics of Redclaw opened the door to many possibilities which were explored as part of the Selective Breeding Project. By far the most significant of these was in fact a revolution in the way that Redclaw could be farmed. The term “S3J Farming” (Stage Three Juveniles) was coined. 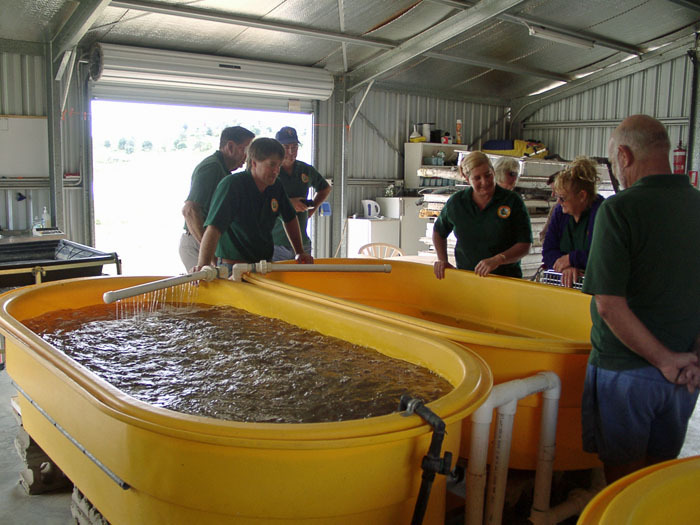 S3J Farming involves buying batches of S3J (Stage Three Juveniles) from the hatchery and stocking them into a pond. A Stage Three Juvenile is a young Redclaw at the stage of development where it would naturally leave the mother. It is a convenient and logical stage to transfer them from the hatchery to the farms. The hatchery supplies animals of known quality bred from the improved stock produced in the Selective Breeding Program, and can do so all year round allowing maximum use of the premium summer growing season. This is particularly beneficial to farmers in temperate areas. Because the S3J are produced in an incubator they do not carry inherent diseases common to most Redclaw populations facilitating further improvement in growth rate. The hatchery operators producing S3J are dedicated to continuing the good work done by the Selective Breeding Program. The result is that the quality and growth rate characteristics of the redclaw produced in the hatchery improve with each mating season. Ponds are stocked with animals all the same age on the same day. The hierarchy effect of larger animals inhibiting the growth of smaller ones is no longer an issue. The biomass of the pond is calculable at any time as there is a known starting point, allowing the use of a designed feeding regime. Although Redclaw do still grow at different rates, the spread of sizes at harvest is not as pronounced. The labor to stock a pond is negligible, water use and the energy to pump it is reduced. Premium stock otherwise used for breeding can be sold at a premium price and effort can be concentrated on perfecting growout methods. Ponds otherwise taken up by breeding can be utilized for growout. 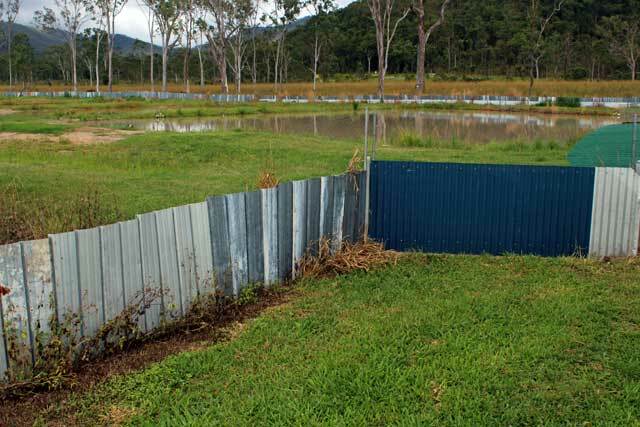 Fast turn around of ponds is possible using “batch in – batch out” farming methods recommended by Biosecurity officers. The adaption of the “S3J farming” method by existing farmers and newcomers to the industry has the potential to revolutionise the redclaw industry and will be responsible for the industry’s ‘coming of age’. To summarise, S3J Farming is a simplified method of farming Redclaw which in fact brings us into line with the practices of other aquaculture industries. The method is labour saving, cost effective and allows significant increases in productivity and consequently profitability. Traditionally, the production of a Redclaw crayfish pond or farm has been judged in terms of tones per hectare per year. This figure can vary from below one to above three depending on a combination of many factors, the most common being the variation in stocking regimes. This adopted yardstick has the potential to be misleading as it includes the weight of all animals harvested from the pond. Often this can include a significant percentage of animals too small for market and also includes those kept for traditional breeding operations. The “Cazzonelli” named after the Atherton Tableland farmer who came up with the concept, is the calculation of kilograms of saleable product per 1000 S3J stocked, per months of growout. This is a practical unit of measurement that does not involve extraneous factors such as pond size, unsaleable stock etc. It uses a constant starting point and provides a direct relationship between production and dollars earned, using the S3J farming method. It provides a simple benchmark for the farmer to use for production assessment. Association members have, over the years, undertaken minor but nevertheless important trials in an effort to improve farming methods and therefore profitability. Many of these are focused on predators, as everything that walks, swims or flies seems to like Redclaw crayfish! These efforts are representative of the product of the innovative mind of a typical Australian farmer. 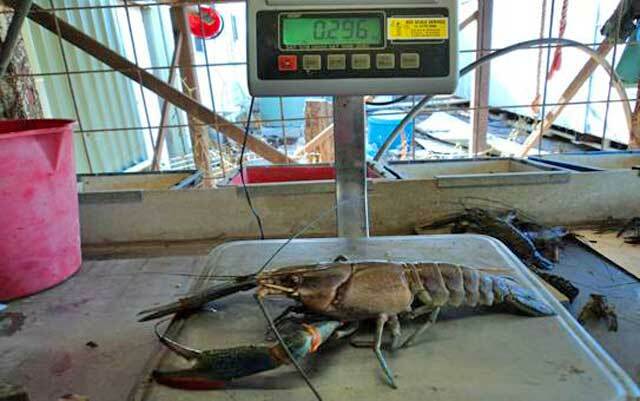 Redclaw crayfish farmers are no less innovative that the rest of Australian farmers! 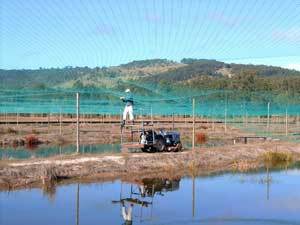 High level bird netting is traditionally the way of excluding wading and diving birds from redclaw crayfish ponds, and no doubt has many advantages over other methods. However, in cyclone prone areas, they tend to have a short life expectancy and are very expensive and awkward to replace. Farmers are currently trialing designs of low level net to find an installation method that is effective and practical as regards to farming operations. December 2018 Bulletin up now! September 2018: A sequel to the well-received book “Redclaw Farming – Getting Started” will be launched at the NQCFA meeting on 29 September 2018. Titled “Farming Redclaw – Let’s do it Right!”, this book carries on from where ‘Getting Started’ finished. read more…. June 2018: AquaVerde Redclaw hosted the board of AgriFutures (former RIRDC) to promote redclaw and explain its potential to them. They are strong supporter of the redclaw industry and it was great to give them an opportunity to see how their money is being spent. 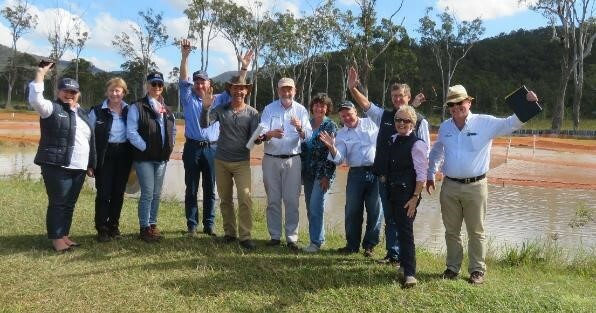 NQCFA: next meeting on the Atherton Tablelands on Saturday, 6 April 2019 at Richard Hunt’s farm in Koah, commencing at 1pm. Please bring a chair, your coffee cup and a bickie for smoko. Afterwards we will dine at a restaurant / pub in Mareeba. Queensland Crayfish Farmers Association Inc.